Dr. Josh first attended Louisiana State University intent on becoming a pharmacist. Soon, he found himself with a lack of enthusiasm in his course work. ‘’I realized I was working toward the wrong profession for my interest and passion.” He saw a poster around campus for chiropractic college and looked into it. Dr. Josh switched gears and decided to go into the chiropractic profession, first achieving a Bachelor of Science in Kinesiology. Dr. Josh takes pride in the trust that the parents of our community place in him, knowing that he can provide care that keeps their children healthy from birth. He also sees many patients that are referred to him from area OBGYNs and other health professionals who respect his natural, effective approach. As a member of the International Chiropractic Pediatric Association, Dr. Josh has trained extensively in chiropractic care for all ages of children, from newborns to teenagers. He’s also certified in the Webster Technique, one of few in our area that has this qualification to adjust pregnant women. Dr. Josh is also one of few in the state who is certified in Activator Methods®. When he’s not in the practice, Dr. Josh likes everything sports-related, whether watching them on television or playing basketball. He enjoys being on the lake kayaking and paddleboarding and goes for hikes when he has time. He’s also a member of BNI® Louisiana, a networking organization. Book your time for a same-day appointment, or walk into our office for a convenient visit. 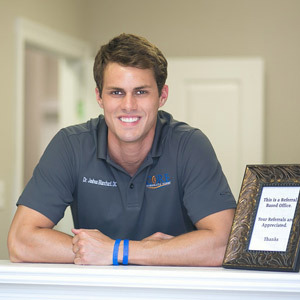 Dr. Josh looks forward to discovering how he may be able to help you!